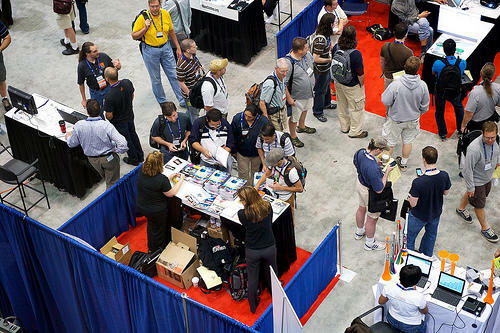 OSCON 2010 was awesome as usual! It was great working the booth again this year with Rikki Kite, Joe Casad, as well as capturing interviews on the floor of OSCON with Trevan McGee! The booth traffic was steady and there was a lot of interest in not only Linux Pro Magazine but Ubuntu User, and the Admin and Perl specials as well. I would ask people if they used Ubuntu and if they said yes then of course I got to tell them all about Ubuntu User Magazine. The majority of people I talked to at the booth were using Ubuntu, some were thinking about about switching over so it was great to point them to the Ubuntu Booth for an Ubuntu 10.04 Lucid Lynx CD for them to talk to about switching over. There were also people who asked about Fedora and luckily Karsten Wade, Larry Cafiero and Robyn Bergeron were at the Fedora booth and were happy to talk anyone about Fedora. One of the coolest moments for me personally while I was at the booth was people coming up and telling me they read my blog(s) both this one and my personal one over at akgraner.com. There were people from Germany, Malaysia, and other places around the world who mentioned either reading my posts through Planet Ubuntu or being a direct subscriber. That was awesome! I also got some great feedback and suggestions on what they would like to read more about. Trevan McGee who is the newest news reporter for Linux Pro/Ubuntu User was there as well and he was a riot. I had a blast tagging along and running the camera for him while he interviewed Marvel, BlackRay and others. Trevan also gave me the opportunity interview a few people as well: John Pugh from Canonical, and Alison Randall from O'Reilly. As soon as those are available I'll add some links. Thanks Trevan! Looking forward to reading more of your posts and articles! 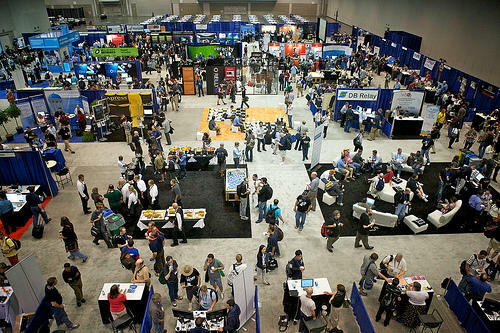 Expo Floor of OSCON 2010 - Photo by Elizabeth LePage. I had the opportunity to talk to Karsten Wade of Red Hat, Inc, about some ideas I had about mentoring leaders in Open Source Communities and finding ways to give the volunteer leaders across all areas of Open Source the ability to identify what skills they were strongest/weakest in and what tools could be provided for building stronger more efficient leaders. Karsten is awesome and I always walk away from conversations with him feeling very enthused and excited about community and ways I am contributing, but even more than that he encourages me to continue getting out there to find new ways to spark people's interest in Open Source. Thanks Karsten! Yes, there is something to be said for being a Catalyst! I also had the opportunity to talk to Ellen Ko and Cat Allman of Google, they always challenge me in very unexpected ways. I met Ellen for the first time at the Atlanta Linux Fest and Cat I met at the Southeast Linux Fest this year. They are always upbeat and full of energy as well as honest feedback delivered in a ways that encourage continued contributions while being able to point out ways in which things can be done better or more effectively. The ignite talks were fun as well. Anytime you have 5 minutes and 20 slides that are auto-advanced it's a fun time. If you missed the talks make sure you find the time to go back and watch them. It's amazing just how much information you can pack into 5 minutes. The talk of the OSCON 2010 was definitely Rackspace and the OpenStack project. Rackspace is opening up the code on their cloud infrastructure and according to their July 19th announcement the code that powers Rackspace's Cloud Files are available now and later this year the code that powers their Cloud Servers will be available. It's an exciting time for anyone even remotely interested in Cloud computing. Rackspace through their OpenStack project is making sure a cloudy day in open source means bright and shining success for anyone choosing to use, deploy or develop cloud based server technology. There is even an interview with Rick Clark and Paul Voccio of Rackspace by Linux Pro editor-in-chief, Joe Casad you can view it here. Here's to OSCON 2010 and looking forward to an even better OSCON 2011!